Russia’s container ports demonstrate strong growth in 2017. From January through to June 2017 they handled 2.26 mln TEU, surpassing the data of the same period in 2016 by 15,3%, informs TASS news agency quoting the Association of Russian sea commercial ports. Both import and export volumes continue the upward trend of the first quarter: imports up 17.3% to 971.57 th. TEU and exports up 15.4% to 952.1 th. TEU. However, it is interesting to note that full export boxes have slowed down their pace: +8,7% (577.3 th. TEU), whereas in Q1 2017 the growth rate was 13.6%. At the same time, evacuation of empty boxes increased: +26.1% (374.8 th. 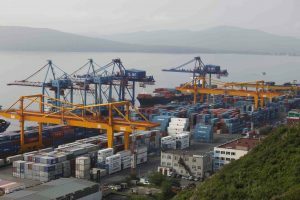 TEU), while in the first quarter the growth rate of empty exports was just 10%. Whether it signals of a slowdown in containerisation of exported materials or it is just a seasonal correction, we will be able to conclude at a later stage of the year. Local cabotage volumes were 311.88 th. TEU (+10.5%). Transit volumes grew by 12.8% to some 27 th. TEU, which is still far below of the volumes of the pre-crisis year 2014 (52 th. TEU). The growth has been observed in all Russian port regions, with the Far Eastern ports demonstrating the highest increase: +26.4%, up to 683.57 th. TEU, which was largely achieved through a surge in imports: +44.6% (210.7 th. TEU). Vladivostok, now the largest container port in the Russian Far East and #3 nationwide, handled 381 430 TEU showing the largest growth rate among all Russian ports: +34%. The Black Sea ports grew by 17.3% handling 402.57 th. TEU, which was mostly the volume of Novorossiysk (395 110 TEU, +17.6%), the 2nd largest container port in Russia. The Baltic ports, which are Russia’s largest in terms of container throughput, handled 1.1 mln TEU (+9.5%), making up 49% of the country’s total container volumes. The growth here was also, like in the Far East, achieved due to a 10% rise in imports (565.7 th. TEU). The port of St. Petersburg handled 953 910 TEU (+7.7%) and confirmed its status of Russian container hub #1. The TOP 10 Russian stevedoring companies handled 1.64 mln TEU or 72.5% of the total Russia’s container throughput. This TOP 10 ranking is headed by Container Terminal Saint-Petersburg (CTSP, part of UCL Holding), which handled 319 020 TEU and registered a 10.7% y-o-y growth in January-June 2017 accounting for 14.1% of the total country’s box volume. The remaining stevedores’ results can be seen in the table below.